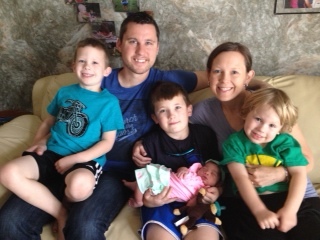 In April 2014 we welcomed Esther Grace into our family. Our domestic process started in April 2012, so we waited a full 2 years before God had the right one for us. God has blessed us with a precious little girl and her amazing birthmom whom we love. Open adoption was the perfect choice for us. We had a great experience with Bethany Adoption Services (www.bethany.org). A tremendous blessing for us when we began this process was Dr. Russell Moore’s book, Adopted for Life (http://www.russellmoore.com/books/). I’d love to answer more questions about adoption. It was the hardest yet best thing our family has ever journeyed together. Thanks friend! Keep praying…it’s HARD to be patient!